Ancient Worlds An illuminating and spectacular six-part odyssey tracing the development of Western civilisation – from the first cities of Mesopotamia to the fall of the Roman Empire. Academic and archaeologist Richard Miles travels through the Middle East, Egypt, Pakistan and the Mediterranean to discover how the mainstays of our society – community, democracy, commerce and technology – were forged and fought over in a series of classical cultures. Ancient Worlds tells the amazing stories of disappeared, ruined and modern cities – from Ancient Iraq to Augustan Rome, and from Phoenicia and the city states of Greece to today’s Damascus – and reveals the compromise, ruthlessness, sacrifice and toil that made each city work. 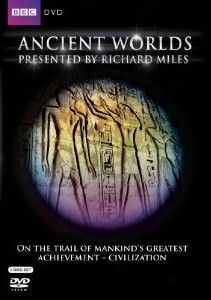 In an epic sweep of history against a panorama of stunning locations, Richard Miles, with the help of local experts and archaeologists, brings these legendary civilisations back to life to show how the successes and failures of the ancients shaped the world that we have inherited.